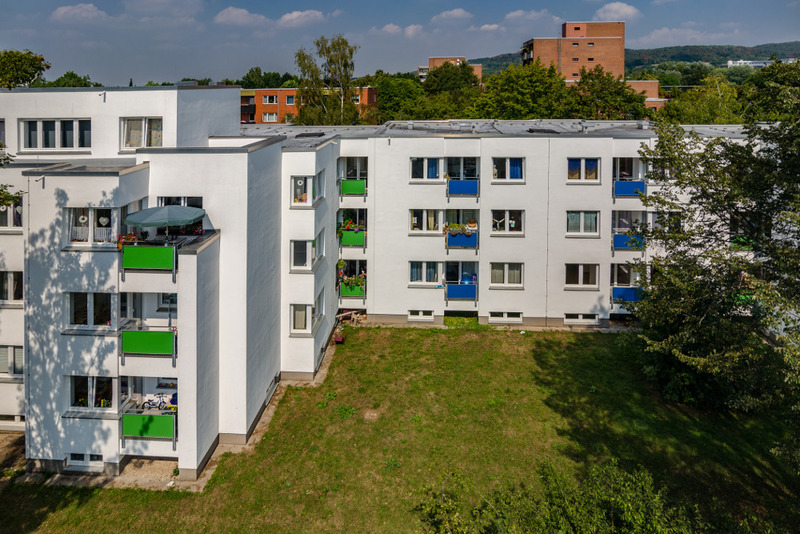 Centrally located between the city centre, Nord-Uni, near the sports centre and the hospital, is the family-friendly residential complex Hermann-Rein-Straße. The quiet residential complex is mostly inhabited by families. The apartments are, therefore, mainly suitable for couples. The 42 2-bedroom apartments and 2 double apartments are unfurnished and have a shower or bath, have a loggia or roof terrace and are equipped with a kitchenette. Internet and telephone connection and satellite antenna for TV/radio are in each flat. There is also a sauna in the complex. The double apartments consist of two rooms, where one room is a large walk-through room, and are only suitable for couples. In addition, the dorm has a sauna. The shared flat for 2 people consist of three rooms but are mainly suitable for couples due to the floor plan of the rooms. In addition, the dorm has a sauna. The double apartments consist of two rooms, one room is a large walk-through room, and is suitable only for single parent with child. The apartments are assigned according to social criteria (urgency)! The 3-room flats are available for families with children. The apartments are assigned according to social criteria (urgency)! Information on the application formalities here.